Baladev Jew Temple is situated in Ichhapur (Tulasi Khetra), Kendrapara, Odisha. Baladev Jew Temple is a very famous temple of Odisha and Balarama is its main divinity. 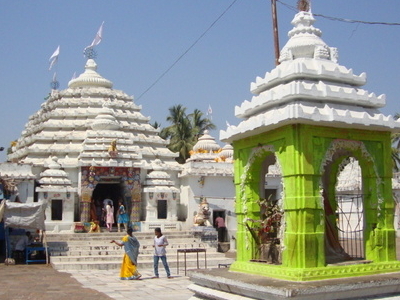 However, Jagannath and Subhadra are also worshiped in the Ratna Sinhasan in the main temple. An idol representing tulasi as a goddess in a seated position is also present after the sacred seven steps. Baladev Jew Temple is constructed over an area of 2 acres of land. There are 2 parts in the total area, in one part, different temples are there and another part is a beautiful garden. There is a big boundary around the temple, which is 14 meters high. If you want to add more information about Baladev Jew Temple of Kendrapara, then fill the below comment box and submit that. We will add the information to this post with your name in our next update. Give Responses for "Baladev Jew Temple, Kendrapara, Odisha"